Take them for $50.00 each complete with instruction sheets. This three-piece service connection fitting consists of PVC hub adapter, rubber sleeve and a stainless steel band. 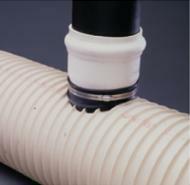 The fitting creates a compression fit into a cored wall of the mainline pipe allowing services—new or existing—to be connected. Royal Inserta-Tees® fittings can connect 100 - 375mm (4 - 15") services to any type of solid wall or profile sewer pipe on the market, including concrete pipe. Standards: Certified to ASTM D3034, F1674 and F477. 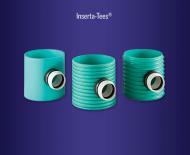 INSERTA TEE is a three piece service connection consisting of a PVC Hub, Rubber Sleeve, and Stainless Steel Band. INSERTA TEE is compression fit into the cored wall of a mainline and requires no special tools. Inserta Tees are designed to connect 2" (51MM) through 30" (750MM) services to all known solid wall, profile, closed profile, and corrugated pipe manufactured today. We are the broadest line of wastewater or storm water lateral connections in the world. INSERTA TEE the GREEN alternative to tapping sewer mains. Traditional methods of tapping Sewer and Storm mains include in-line fittings, metal saddles, PVC saddles, synthetic rubber saddles, and Inserta Tees. The first measure of the best Tap for the environment must be performance. Any sewer or storm connection that does not seal in a watertight air testable manner is bad for our environment. 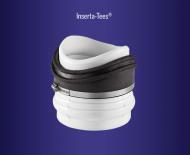 INSERTA TEE is the clear choice by this measurement. No other connection will seal the Tap as effectively as an INSERTA TEE . Independent Lab tests (available on request) show 13 PSI on Concrete and Clay, 15 PSI on Polyethylene, and 28 PSI on PVC.